Whenever I get a client that requests a relaxer, my first question to them is always when was the last time they got one. If they even look like they are about to fix their mouth to say six weeks, the answer is an automatic no. Yes, I do tell some of my clients no when they request certain services. It is a polite no of course, but still a no. I have never been the type of hairstylist to simply do whatever my client asks if it puts the hair's health at risk. If it jeopardizes the health of the hair, I politely explain why I do not think it would be a good idea. A lot of my clients want to get a relaxer at the first sign of new growth. Why? Because any hair that is not bone straight on their head intimidates them. I encourage all of my clients to stretch their relaxer far beyond six weeks and I will share with you why you should do the same. Health hair grows at a rate of half of an inch per month. At six weeks (1.5 months), you have approximately half of an inch to three fourths of an inch. Any time you get a relaxer you are only supposed to relax the new growth. No relaxer is supposed to touch any hair that has already been relaxed. If any relaxer gets on previously relaxed hair, that is called overlapping, which means that the hair has been over-processed and always leads to damage. The goal of the hairstylist is to apply the relaxer onto the new growth, then smooth it through, all while only remaining on the new growth hair only. Honestly speaking, not many hairstylists, including myself can relax hair that is only half of an inch long and not get any of that relaxer onto previously relaxed hair. This is right at 2 inches. 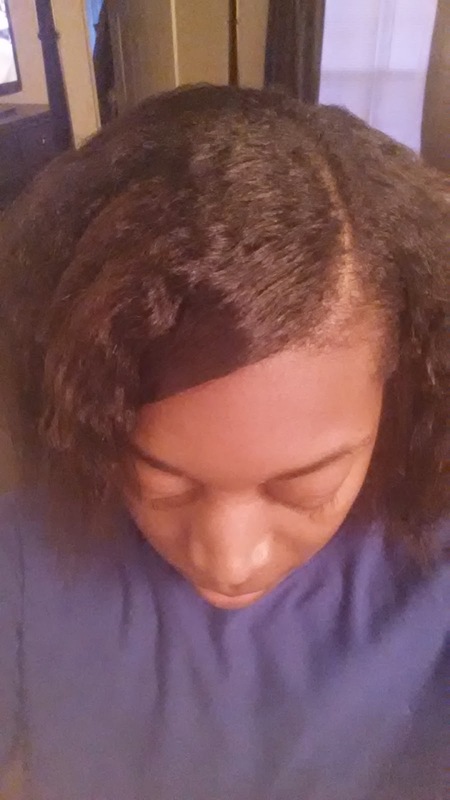 This client can now safely get a relaxer without getting any damage to her hair. Although you may not notice immediate damage from overlapping, the signs will be there. Women who relax their hair every six weeks may soon notice that their hair is much thinner than it was before they got a relaxer or their hair will be thick at the roots and then on the ends. This is the result of hair that is being constantly relaxed and over-processed. Over time, the hair will become thinner and much weaker. The hair is thicker at the root because that hair is healthy. As that hair grows down the hair shaft and begins to be relaxed every six weeks, it will also become thin. Also, some women may think that their hair begins to break at six weeks, or when it is time for a touch up. Wrong! The hair is breaking as a result of being over-processed. The line of demarcation, or the line where the relaxed hair meets the natural hair, has become so weak that it begins to break. This is also the reason why the hair seems to not grow. The truth is that the hair is growing, but it is breaking even faster so to the naked eyes it looks as if the hair is remaining the same length. my new growth laying down! I used foam wrap to do this. In order to stop this breakage and fix the damage that has been done, you do not have to give up relaxers altogether. 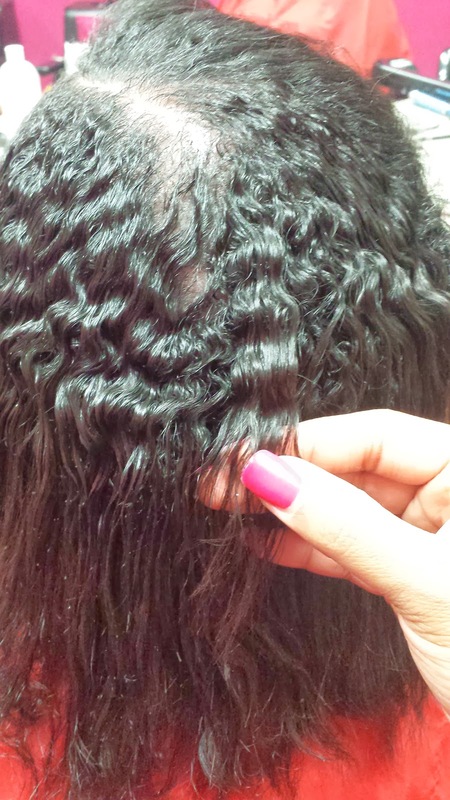 You can absolutely have healthy hair and a relaxer, if you use the relaxer correctly. I recommend getting at least two inches of new growth before you relax your hair. That means, if your hair grows half of an inch per month, it would take the average person four months, or sixteen weeks, for the hair to grow that much. 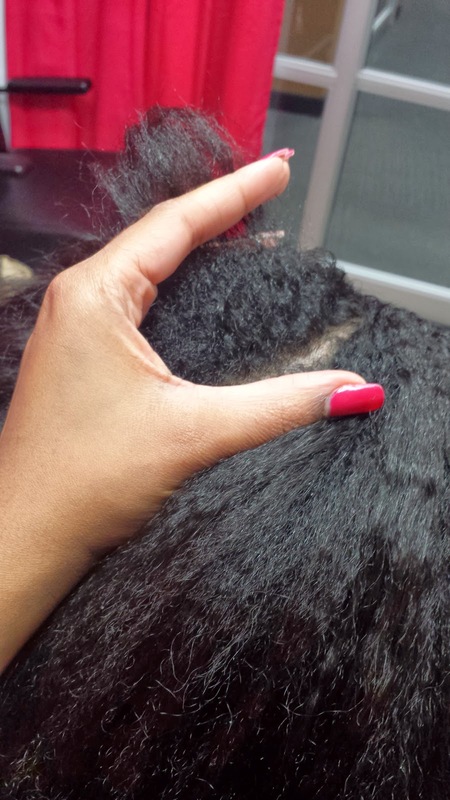 Therefore, you should stretch your relaxers a minimum of sixteen weeks so that you have enough new growth to relax without it overlapping at all. When doing this, you will see the hair get longer, stronger, thicker, and most importantly, healthier! I personally go six months in between relaxers. By the time I get my touch up, I have about four inches of new growth, so over-processing is the last thing on my mind. So, from now on, stretch your relaxer out and watch your hair transform. 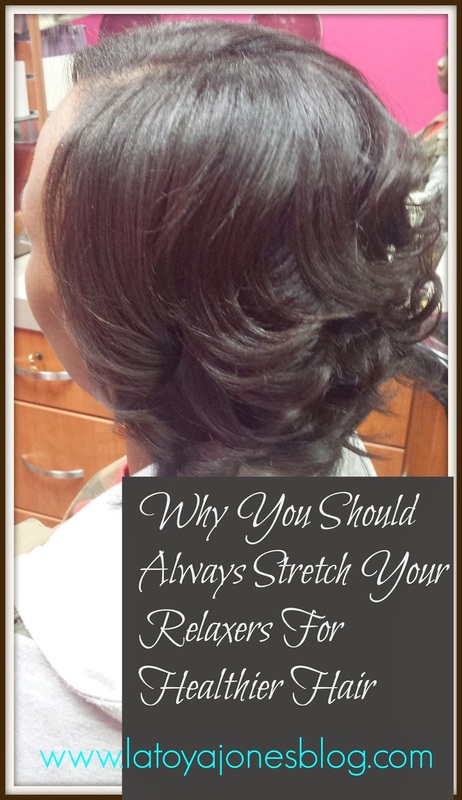 Need help stretching your relaxers? Unsure that you can do it? Be sure to check out the "How To Relax Your Relaxer Series" for more tips. I really enjoy reading your Blog and your perspective of achieving healthy hair being a hairstylist. In your blogs and youtube videos you always say that "healthy" hair grows at 1/2 per month. I've noticed that everyones hair grows at different rates and health and genetics play a part in the growth rate of hair. When you say "healthy hair" is that just your way of saying that the average growth rate is 1/2 inch or do you believe that if you're not gaining 1/2 inch per month that your hair/scalp is not healthy? I say this because I have a slower growth rate of about 1/4 per month therefore it would take me almost 8 months to get 2 inches of hair as i average 4-5 inches of growth per year. I am not medically ill or unhealthy. I used to relax every 4-6 wks until i started my hair journey. Now i stretch for 12 wks and average about 1 inch in this time. I have a really hard time stretching this far so know that i would be causing more damage than good to stretch until I get 2 in, as i don't wear weave or braids to help with the stretch. If I came into your salon every 12 wks with around 1 inch of growth would you be resistant to give me a relaxer that often? I really enjoy reading your Blog and your perspective of achieving healthy hair being a hairstylist. In your blogs and youtube videos you always say that "healthy" hair grows at 1/2 per month. I've noticed that everyones hair grows at different rates and health and genetics play a part in the growth rate of hair. When you say "healthy hair" is that just your way of saying that the average growth rate is 1/2 inch or do you believe that if you're not gaining 1/2 inch per month that your hair/scalp is not healthy? I say this because I have a slower growth rate of about 1/4 per month there for it would take me almost 8 months to get 2 inches of hair as i average 4-5 inches of growth per year. I am not medically ill or unhealthy. I used to relax every 4-6 wks until i started my hair journey. Now i stretch for 12 wks and average about 1 inch in this time. I have a really hard time stretching this far so know that i would be causing more damage than good to stretch until I get 2 in as i don't wear weave or braids. If I came into your salon every 12 wks with around 1 inch of growth would you be resistant to give me a relaxer that often?